Looking back on Fridays game vs England, I wanted to make a special note to acknowledge an incredible achievement that was made. One of our veteran players, reached a new milestone in her career. One of just 12 players to achieve this, she is an icon of women’s soccer in Canada. Melissa has been an integral part of our program, playing and scoring in some of the biggest games we have played, and of course being a part of the historical Bronze medal team in the 2012 London Olympics. Melissa is someone who you cant help but notice on the field with her determination and grit, always going in 100%, putting her body on the line to win tackles or put the ball in the net. She is the first to get up and dance in the locker room, and her humour is contagious…although her “knock knock” jokes need some work:) I talked with Melissa for a bit to ask her some questions and get some feelings on this memorable day. What did it mean to you to be able to play such a significant game in your hometown? Melissa- Obviously it was extremely special, the fact that it was my mom’s birthday and I had over 100 family and friends there as well, made it like a storybook. 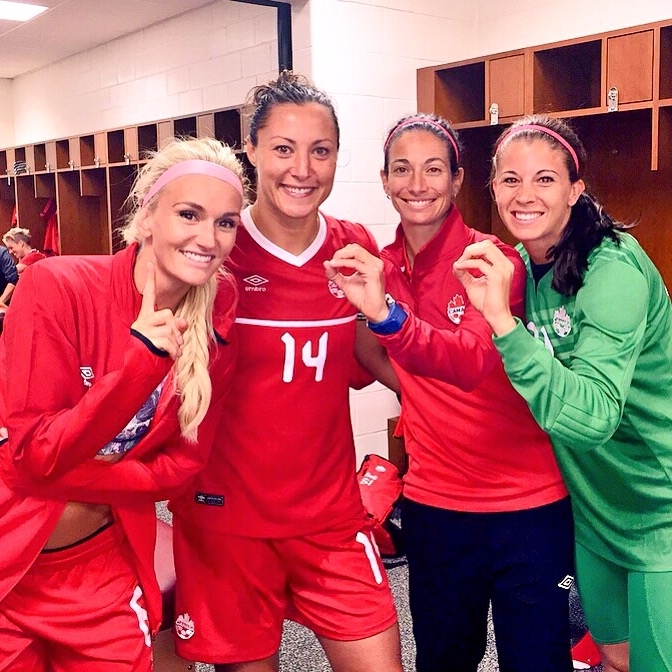 Not many people get to play their 100th cap at home in Canada, but I got to do it in my hometown. Of your 100 caps, before this one, what was your most memorable one? Melissa- It has to be the bronze medal game in London. We made history as individuals and as a team, and i think that even though it wasn’t necessarily my most memorable individual performance, i will always remember that as the most memorable team performance. What does it mean to be one of just 12 Canadians to earn this honor? Melissa- I never really thought about this until after the 100 caps. It really was because people told me to stop and realize what this is. It’s a true honor to play for my country, but to think about the fact that i have put on that jersey 100 times is pretty incredible, and it hasn’t seemed like that long at all. Do you remember the moment or game throughout your career where you really began to feel like this was your calling? Melissa- Probably for me it was my first World Cup, 2007. That was the first time I actually scored in a big game and massive tournament for my country. Before that, my consistency was lacking as a player and i was happy with just coasting under the radar, but that moment sparked me to believe in myself and believe that there was a future for me on this team. You have scored 22 goals in your career so far, what was the most memorable goal? Melissa- The one against Sweden in the olympics at St.James park in group play where we needed at least a tie to move on. It was special not only because of the result needed, but for John. We really wanted to get that result for him, in his hometown and his home club’s stadium. Is there someone or a few people that you credit to your success? Melissa- I want to thank my immediate family for sure. Mostly because they weren’t pushy with any of my decisions, they allowed me to make my own decisions and go on my own journey. Most of all they were very supportive and patient with me when i took time off soccer for school, i think it was extremely hard for them but they saw the bigger picture and realized how much my education meant to me. Where do you see yourself going from here? Melissa- Up. haha. I am hopeful that i will stay on for at least another year, especially for the Olympics. I definitely see myself getting into a clinic and opening my own somewhere, location yet to be determined haha. What was the best advice you were given throughout your journey so far that you could pass on to the youth of Canada? Melissa- It came from a very intelligent individual. Melissa Tancredi. I told myself that there is basically no reason to put limitations on yourself because i have no idea what my body can do, my mind can do and the potential it has is greater than you could ever imagine.